Not too long ago, as I was sitting all alone at table number 10 in the middle of one of my favorite places in all of Bangkok, Or Tor Kor Market, I thought of you. Sure, I was eating alone, but, no, I wasn’t lonely. One cannot possibly feel lonely with a bag of mangosteens and a bag of durian nestling against one’s left hip — or right hip, for that matter. I was just thinking that you might be interested in how the Thai people eat their satay. I could be totally wrong about that, but I’m already four and a half sentences into this post and I’m not a quitter. Disclaimer: there’s no canonized set of rules when it comes to eating satay in Thailand. Heck, there’s no canonized set of rules when it comes to eating anything anywhere. My role here is to report what’s usually done. Also, I’m a fan of personal freedom. Though I might avert my eyes when seeing someone eating Thai food with rice with a pair of chopsticks and firmly believe that it is a less than optimal way to enjoy Thai food, I will defend their right to eat that way. So, anyway, in general this is how most Thai people eat their satay. Take it for what it’s worth. No silverware is given. The reason is that no silverware is necessary. You take one skewer of satay and dip it in the peanut sauce. 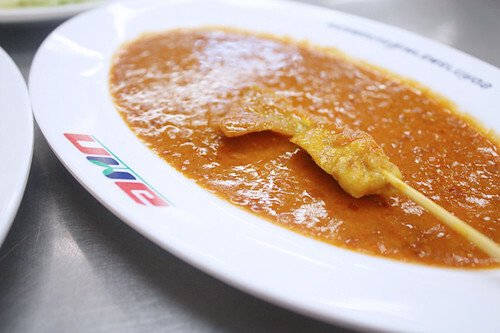 (Notice that the peanut sauce is always served on a plate or a shallow, flared bowl. This means you’re forced to dip the satay in the sauce horizontally, one side at a time.) Then you take the peanut sauce-coated satay into your mouth, positioning it between your upper and lower teeth (or denture in some cases). You clamp down on it. With the meat secured with your teeth, you slowly pull out the bamboo skewer. That’s your first bite. Gee, am I being ridiculously too detailed? Please don’t answer. I’m just going to be moving right along. See, this is precisely why they don’t give you any silverware. Guess what — you now have a utensil in your hand. That bamboo skewer now serves as a spear with which to gig (a term I learned from Mike Sula of the Chicago Reader) stuff. Now, your second bite could be a piece of toast or anything from the cucumber relish plate. I personally use ajat as a palate cleanser after each bite, so I usually follow a bite of satay with a bite of cucumber relish. 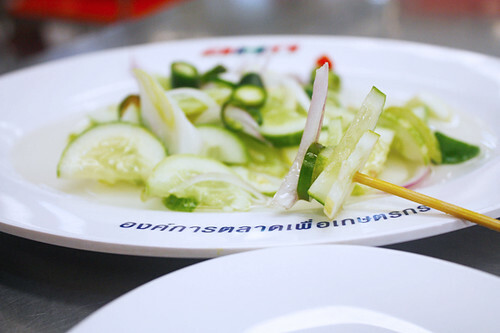 With the bamboo skewer, I then pick up a perfect bite of ajat consisting of — oh, I don’t know — maybe a couple of slices of cucumber, a slice of shallot, and a slice of pepper. After a bite of cucumber relish, I turn my attention to the toast. You see, the toast itself is nothing special; it’s kind of bland. So I dip it in the peanut sauce before eating it. That is followed by another bite of ajat. Then we’re back to the satay. Lather, rinse, repeat. Now you can see that the whole idea of a chicken satay sandwich is neither new nor heretical; it’s just another way of presenting these components wherein all of them are held in your hand and consumed together in each bite. N.B. – Pork satay served in the food court area of Or Tor Kor Market is horrible. What you see in these pictures don’t taste very good. If you’re at Or Tor Kor, go for the satay stalls that sell satay to-go. Forever reader first time writer….I have made SO many of your amazing recipes…every thing from your Grandma’s ambiguous yellow chicken, your spring rolls, pad see Ew, crispy chicken, turmeric whole fish & jaew…..and many more….everytime I make a new thai recipe my husband asks where I get the recipe from and my answer is ” you know..my Thai blogger Leela” .needless to say we love you..and your recipes….When I visited Thailand last year I remember a friend of mine trying to order satay chicken and rice ” not on sticks”…to her dismay it always came on sticks even though they said it wouldn’t….hahahaha …made me laugh!!! Entertaining, as always. 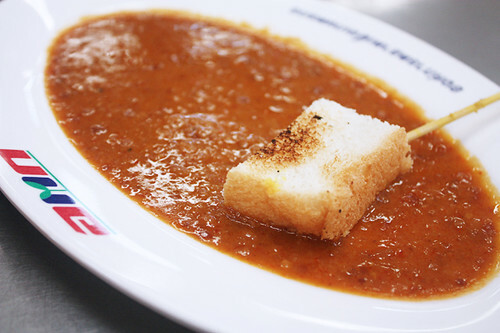 I’ve never seen the bread, but (I am sad to admit) I was terrified of getting sick from street food when I was in Thailland, and satay seems to usually be street food there (from what I could tell). I felt like I missed out on a lot in Thailand from being paranoid, so I was more adventurous in Morocco–and extremely sick for about 5 days, almost had to fly home. Soooo….. No easy answer for our western stomachs! Leela, this is so much fun! I love the bite-by-bite tutorial. Not having tried a bite of this pizza, I’m loving it already! Dear god I miss the street food in Thailand….although whenever my mom purchased this for me to eat there was never any bread, so I didn’t even know there was normally toasted bread until I read your entries. But yeah, reading this on a late night when it’s getting chilly on the East Coast is definitely giving me some cravings, that’s for sure. The street food in northern Thailand is amazing but haven’t braved traveling to the south yet. I love your posts….they make me laugh and drool! Hi Leela, your recipe reminds me a lot to what I used to have as late night snack in Indonesia. We shared the same way to prepare/ grill the satay and consume it. The only difference is they don’t serve toast with it. But, it’s always a good combo! 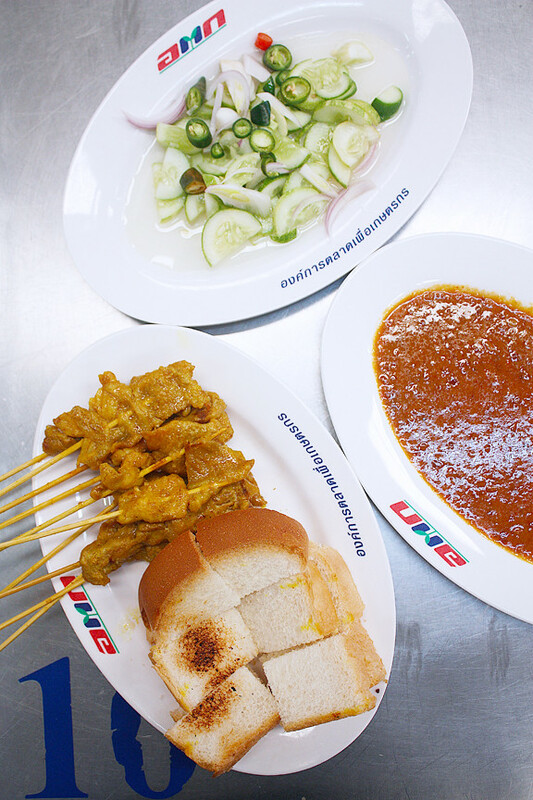 Linda, Thai satay has definitely been influenced by the different satay/sate traditions of our southerly neighbors. Really strange as i just made some of these the other day with the the two sauces and was curious as to how to eat them with the cucumber sauce as its not really a dipping dip and you magically come up with a post on how to eat satay. Hi Leela — Just want to congratulate you on this amazing website. I’ll be trying all of your recipes! I wonder why pork satay is always unseen in the west and thus, not popular there at all….. 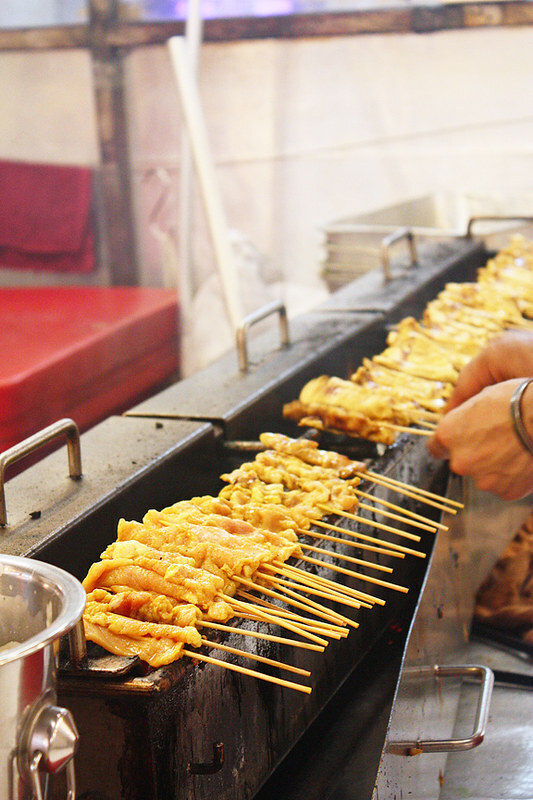 While chicken satay is unseen in Thailand and I have yet to see a street stall sell them in Thailand…. It’s quite interesting how cuisine changes to suit it’s audience, and make me wonder, would westerners order a pork satay if they had the option and would Thais prefer chicken over the traditional pork satay… oH the never ending complexities and intricacy of Thai cuisine! Pete, I was thinking the exact same thing as I was writing this post. The child bride and I sell satay at our local farmers market (east coast australia). We used to do beef, chicken and pork. Could not sell pork for love or money, have no idea why. Chicken was always the best seller. That’s interesting, Drew. I’ll choose beef or pork satay over chicken satay any day. Great post! I’ve never come across a vegetarian version of satay, but I’m sure if I ever do that you’ve just saved me a whole lot of embarrassment! I like to dip my bread into the ajaht. New to your site, but loving it. For the pork satay: I couldn’t find anything that tells me exactly what to do with the pork before grilling. Do you season it, or is it just pork and the sauce is the end seasoning? Rosie, that’s because I haven’t posted the recipe for pork satay. This post simply shows you how to eat it, not make it. There is, however, a quick, short-cut recipe for shrimp satay which you may find helpful: http://shesimmers.com/2009/04/shrimp-satay-with-thai-peanut-sauce-สะเต๊ะกุ้ง.html It’s not the same as pork satay, though. The Thai restaurants in the greater San Francisco Bay Area have pork sate. It’s my favorite and what I always order. I have to say that it’s a good thing I’m not eating it in Thailand because I’ve been doing it all wrong. 😉 My way is closer to your chicken sandwich — I dip the meat in the sauce, lay it on the bread, then put the ajat on top of that and proceed to make a mess trying to eat it. I mostly do it that way because I’m a wimp with hot stuff, and the jalapenos or whatever hot pepper is used are tempered by the meat and the bread. I never thought of the palate cleansing aspect of it. Like everyone else, I have to thank you for your amazing blog. I come back again and again for recipes, but this is the first time I’ve commented, I think. Wonderful stuff.